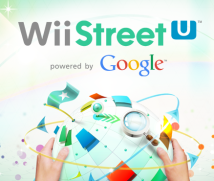 Today, I’m going to ask about Wii Street U Powered by Google, software that uses the Google Street View1 function of Google Maps2 on the Wii U console. 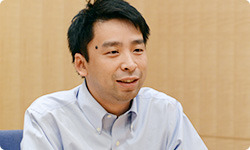 I asked Kawai-san, who’s responsible for the Street View product at Google3 headquarters in America, for this opportunity to meet during his visit back to Japan. Thank you for taking time out of your busy schedule. 1. Google Street View: This function of Google Maps allows users to view locations as if they are standing right there on the street. Click here for more information on Street View. 2. Google Maps: An online mapping and local (regional) search service that Google provides around the world. It allows users to view the whole world through maps and photographs while adjusting the scale of the area to view. 3. Google: Founded in 1998 in California. No, not at all. Thank you for the invitation. It’s a pleasure. Kawai-san, the development team has brought the most recent version of the ROM that they wanted to show you today. Before we go into details, I’d like to have them show that to us. Do you mind? Great. Let’s start with Suzuki-san and simple self-introductions. I’m Suzuki from the Software Development & Design Department. I am in charge of direction. I barged in on Google and teamLab4 and did all sorts of work that was brand new to me. (laughs)4. teamLab Inc.: A company involved in a broad variety of areas centred around Internet and software development. Founded: 2001. Head office: Tokyo. 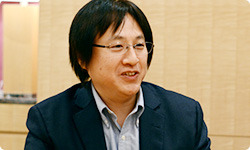 You gave a presentation about Wii Street U at the Google head office in America the other day. Yes. I went together with staff from Nintendo Software Technology (NST)5, which developed the fundamental elements of the system overseas.5. Nintendo Software Technology (NST): A development subsidiary of Nintendo based in Washington State. Thank you for coming the other day. Ever since, everyone has really been looking forward to the release. I’m Ohashi from teamLab. I helped with the programming for elements such as the UI6.6. UI (user interface): This refers to the content displayed on displays like windows, menus and other elements that help users interact with and operate a computer. Well, we were just barely able to pull off the ROM this morning! (laughs) Together with Suzuki-san and NST overseas, we passed the baton back and forth between our work days to take advantage of the time zone differences so we could develop internationally, literally around the clock. 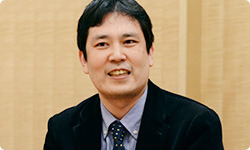 I’m Takahashi from the Software Planning & Development Division. Um… I’m Suzuki-san’s boss. (laughs) Kawai-san, I’m so glad I can finally introduce myself to you, thank you so much for the other day. 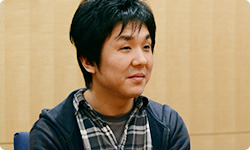 Previously, I worked on directing and producing games at another department. For the past several years though, I have been taking the role as someone who looks at the overall projects, from things like maintaining game development environments to projects that weren’t defined as games until recently like Brain Training7. This time, I’m taking on a similar responsibility.7. Brain Training: Refers to Dr Kawashima’s Brain Training: How Old is Your Brain?, released for the Nintendo DS system in Europe in June 2006.
display the Wii U GamePad screen on the television screen like this and multiple people can watch Street View together. And like this… whichever way you’re facing, the scene showing on the Wii U GamePad screen shows up on the TV. It’s very intuitive in that you just face the direction you want to look. It’s much more comfortable than using a PC or tablet. I like the way you can look around so effortlessly. The Wii U GamePad has a gyro sensor and a geomagnetic sensor8, so just by pointing the Wii U GamePad in the direction you want to look at, that scenery will be displayed on the GamePad screen. It’s just like looking through a small window, and you can feel as if you’re in that actual location. Images can also be displayed on the TV screen. The Street View is available at a very high resolution, so you’re able to see a lot of fine details when you view it on the TV screen, and that gives you a sense of immersion.8. Gyro sensor and geomagnetic sensor: Internal sensors within the Wii U GamePad. The gyro sensor measures rotation, and the geomagnetic sensor detects movement and angles that can be used to enjoy gameplay. The Wii U GamePad also has an accelerometer. In addition to being able to look around 360 degrees horizontally, you can look up. You can really look directly upwards. I never really paid much attention on the PC, but you’ve actually photographed that far up. It seems that everyone has a subconscious desire to look up at the sky. So when we updated the equipment, we had been working on ways of improving things like the camera angles so the sky is better photographed. I see, through the server logs people at Google are able to see where people are looking. You’re saying that a lot of people have a tendency to look up into the sky. But if you look at it like this on a large television, you can tell right away that there are some older photos mixed in here! (laughs) Maybe we better increase the resolution! Now we’re at NASA’s John F. Kennedy Space Center9. The space shuttle10 is in the hangar. If you look up here, you can see the underside of the wings. If you zoom in, it’s like this . 9. John F. Kennedy Space Center: A spacecraft launch site with accompanying control facilities operated by NASA (National Aeronautics and Space Administration), which is in charge of space development for the U.S. government.10. Space shuttle: Manned spacecraft launched by NASA from 1981 to 2011. You can see where the tiles have come off. 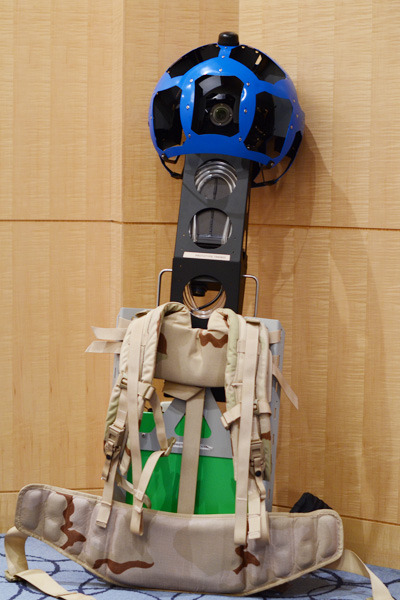 The team at Google really has been to numerous places and captured every nook and cranny. Perhaps now it has become easier for people to look at all these details. Thank you. But I’m surprised how much it has changed from what I saw at the head office just the other day. This project didn’t take long at all from initial planning to the point where we could show some examples. When making a video game you have to create everything yourself, including all visible data. This time, though, all the scenic image data of places around the world is standing by on the Google servers, so once a system that works well with web technology is ready to go, things quickly get moving from there. Until recently, we’ve hardly ever experienced such speedy development, so I’m really excited. Actually, I’ve got something I’d like to show today, too. We just manufactured it, so I brought it to Japan for the first time a couple days ago. What is this? Wow! A capture gear that you wear on your back?! Yes. There are various types of equipment we use for taking Street View photos – like cars and trikes, but what I brought today is our newest, a small and light one for narrow spots. It has 15 cameras of five megapixels each, and if you put the images together into a panorama later, you get a Street View photo with 75 megapixels. The design has some character. Does it have a name? We named it the Street View Trekker from the word trekking. Until now, photographing from stairs and mountain paths was difficult, but now the number of places we can go to has suddenly expanded. The other day, we walked with this through the Grand Canyon11.11. Grand Canyon: A canyon in northern Arizona. Creating the hardware itself when making something is the same as what we do, only the difference appears to be whether it is for commercial or industrial use. It’s good if you can use commercially available materials, but they come with a lot of extra stuff making it heavy. So we customised things, like the battery is a custom order. We used a high-density battery and lightened it by the gram. Would you like to try carrying it on your back? Really? Can I? Okay, I’ll put it on. (laughs) (standing up) How much does this weigh? It’s about 40 pounds, so about 18 kilograms12.12. Kilograms: A unit of mass. One kilogram is about 2.2 pounds. If you’ll pardon me… Hup! 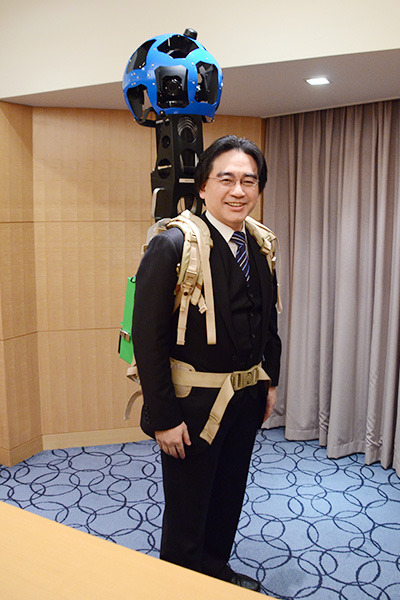 …This is now “Iwata Carries”. Like this? If someone wore this and walked all over taking photos, they would be blurry. Does it automatically adjust for that? It has a number of inertial sensors, but we apply all sorts of compensation later for the up-and-down and side-to-side movement caused by walking and for levelling the tilt from climbing a mountain. Oh, right! (laughs) It isn’t fully compensated automatically, but we do use a little technological help and then perform a variety of operations later on.